Snack Girl recently visited one of her bestest buddies and she had a big cookie jar filled with CLIF BARs. I found myself munching on them and wondering if they were any good for me. Why was I concerned? Well, the bar was called "Chocolate Chip Peanut Crunch" and it tasted super sweet. It reminded me of another one of my favorite packaged snacks when I was a teenager. Yes, dear readers, Snack Girl used to crave SNICKERS bars. I have no idea how many I ate over the years, but I LOVED them. I gave them up when I went to college - I can't remember why. I just want to be clear that SNICKERS is a CANDY bar and CLIF BAR is defined as an ENERGY bar. 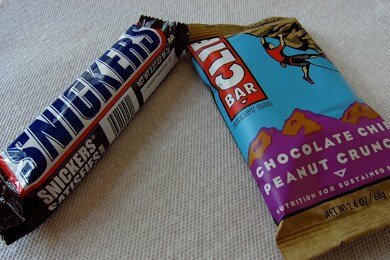 CLIF BARs are targeted at athletes and active people, while SNICKERS is targeted to all of us looking for that late afternoon pick me up (and children in the line at the supermarket - argh). I decided to toss in another comparison at the last minute. I added the nutritional information for SIX Newtons Fruit Thins (which I covered last week). So, the SNICKERS bar is smaller and has less fiber, sodium, protein, and total carbohydrates. The CLIF BAR has fewer calories, less fat and sugars, and is larger. It looks like CLIF BAR is a better choice based on these measures. Organic Brown Rice Syrup, ClifPro® (Soy Rice Crisps [Soy Protein Isolate, Rice Flour, Barley Malt Extract], Organic Soy Flour, Organic Roasted Soybeans), Organic Rolled Oats, Organic Toasted Oats (Organic Oats, Organic Evaporated Cane Juice), Organic Evaporated Cane Juice, Organic Peanut Butter (Organic Peanuts, Salt), Chocolate Chips (Evaporated Cane Juice, Unsweetened Chocolate, Cocoa Butter, Soy Lecithin, Natural Flavors), Peanut Flour, Peanuts, ClifCrunch® (Organic Oat Fiber, Apple Fiber, Inulin [Chicory Extract], Psyllium, Organic Milled Flaxseed), Organic Date Paste, Natural Flavors, Sea Salt. Milk chocolate (sugar, cocoa butter, chocolate, lactose, skim milk, milkfat, soy lecithin, artifiical flavor), peanuts, corn syrup, sugar, skim milk, butter, milkfat, partially hydrogenated soybean oil, lactose, salt, egg whites, artificial flavor. What I think is SO interesting here is the number of times that sugar is listed on these lists - though, in both cases SUGAR is the FIRST ingredient. In case you are wondering, evaporated cane juice is SUGAR with trace minerals because it is less processed than regular sugar. (I thought it was just marketing mumbo jumbo - then I looked it up). You expect SNICKERS to have a bunch of sugar, and I suppose you should expect it in an energy bar, too. You know what? The CLIF BAR isn't that different from eating 6 Newtons Fruit Thins. My suggestion is to consider CLIF BAR and other energy bars in this category like a AMPED oatmeal raisin cookie. Keep in mind that the serving size is too big for it to be considered a healthy snack. A good snack portion is between 100-150 calories (and CLIF BAR does make smaller versions). CLIF BARs are healthier than a candy bar - but not that different from a cookie with whole grain ingredients. What do you think of CLIF BARs? I like the taste of cliff bars. They are also chewy so it takes a while to eat them. At one point I was on a carb cycling diet and I ate one of these at night. The high fiber and protien amounts is a plus for me. Why did you compare 1 serving of Snickers & CLifBars, too SIX Newtons Fruit Thins, which is 2 servings according to pkg.? Making them, if you stick to the 3 thins, WAY better 4 you, than both, right? Thanks, for all the Gr8 Info! @Magic - I chose two serving sizes because it was the closer to the same size as the CLIF BAR - about 60 grams. It wouldn't have been fair to compare 3 cookies to a big CLIF BAR. Make sense? Thanks for your comment! I used to eat Clif bars as meals! But I am cutting sugar out of my life and therefore old Clify is getting cut too. Thanks for the comparison. I'll remember that. almost as bad as eating a snickers bar! Just found your blog and I'm really enjoying it. I understand for the comparison to a candy bar you needed to use a Clif Bar containing chocolate, but now I'm curious how some of the other, just as tasty, less candy like Clif Bars measure up. As to the size, I will normally eat half and save half for later. I agree with you about Cliff bars but I throw one in my diaper bag and use it as a meal replacement or a large snack to keep me from stopping at the food court or mcdonald's. It buys me time to keep me on track without starving myself and caving in and buying Mrs. Fields. I love Clif bars for my marathon food. I'm glad they have the calories, sugar and the sodium I need to replace what I've lost without being too processed and artificial, like GU. Plus, they taste SOOOOOOO good and keep my mouth busy! I just don't see the need to use sugar five times! Lara bars would probably be better as most of them only have 2 ingredients. I easily give Clif bars to my 7 year old for a snack and would not have thought to hand him a snickers. Granted, he does not like chocolate and Clif bars come in blueberry and oatmeal. Thank you for the comparison. I will pull out the carrots and bananas more. I grabbed a cliff bar for the first time during a long drive a week ago. When I stopped at the gas station it was one of very "healthy" options as far as food goes. I normally go for a Kashi Crunch bar because I like the taste and the fiber and protein content, but they didn't have them. I didn't enjoy the taste of the Cliff bar as much, and it was so filling that I wasn't hungry for dinner several hours later. More of a meal substitute than a snack. I love them as a quick on the go breakfast with a hot cup of green tea. Very filling and satisfying. They don't have the health benefits though that i get from my old fashion oatmeal with cinnamon and walnuts. I love Clif Bars! I don't think they're as bad as Snickers because you know where all the ingredients are coming from. The less processed they are the better your body breaks them down, right? That said, they're a little too bag for snacks, but they make wonderful meal replacements and meal supplements. Lets be clear, all energy bars are bordering on candy bars, regardless of brand or labelling. They may have a bit more fibre or a bit less sugar, but they were never meant to be healthy. They are quick means to consume large numbers of calories in a pleasent tasting format and should never be seen as anything but that. Wow good to know!! This is why I just stick with larabars..
We buy these from time to time and keep them in the freezer. They're so good to just gnaw on when they're cold and as a result I usually only eat half. Yummy! My personal preference is to eat a Gnu Orange Cranberry Bar or a Vanilla Almond Crunch Quest Bar (The Quest Bars are amazing). I haven't tried the Clif Bars because I did read the ingredients and saw their resemblance to a candy bar. Cliff bars will have a much lower GI do to the fact that the sugars are much less processed and the high protein content. This makes them healthier as they will be more satisfying for longer, have much less of an impact on insulin response and therefore better for cardio vascular risk factors and diabetes. Also, as the ingredients are more whole, it will have much more vitamins, minerals and phytonutrients. The one I ate after I finished the Brighton Marathon was possibly the best thing I'd ever eaten!